I’m in the middle of the five-week field assignment for work, so away from most of my usual gaming habits and my workbench. All is not lost, however, because the co-worker I’m on this thing with is also a miniature gamer and we decided to bring our Blood Bowl teams along and have an “Exiles Micro League” of two players and four teams while we’re away. It’s something to do other than watch terrible TV during evenings in the hotel suite! I brought a new 30mm fabric BB pitch along, made with felt. This isn’t the dark brown one seen here previously, this one is tan felt and a significant improvement over my first attempt at a BB pitch. I’ll get photos of it at some point, probably after I get home at the end of February. Along with the pitch and teams, I realized we needed a tracking sheet, as I haven’t brought along my tracking scenery due to lack of luggage space. I broke out the ever-reliable Inkscape and worked up a basic tracker – space for two sides to track phases for two halves, re-rolls and score, as well as the two scatter templates. Thumbnail of my Blood Bowl tracking sheet. Full PDF file below! 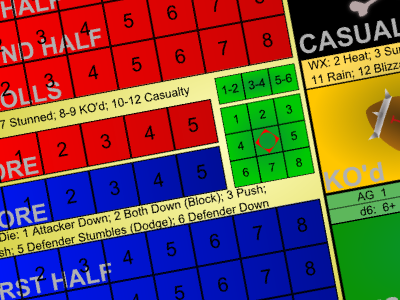 As we played we added a few things with pencil – quick reference notes, mostly, as well as a shared dugout space for players in Reserve, KO’d or Casualties. I’ve gone back into Inkscape to add those to the tracker sheet, and added some colour and graphic flourishes as well. Hopefully someone else finds this useful! BB Tracker Sheet PDF – permission granted to copy or print for personal use. Included Public Domain graphics from the Open Clipart Library. Very nice I’ve nicked it for my BB team tnx.